During the #madebyGoogle event on October 4, Google presented two new Android smartphones, the Pixel and the Pixel XL, putting an official end to the Nexus line. This change of heart had one main reason, which has been repeated more than once by the Mountain View company: they want to have complete control over the hardware manufacturing of their phones. In our review, we take a closer look at the Pixel, the smaller version of the two smartphones with a 5-inch screen, one that we are sure will attract potential buyers who are looking for a more “compact” phone. ✓Google Support service "Care by Google"
The Google Pixel costs $649 if you opt for 32 GB of internal memory and $749 if you go for the model with 128 GB of memory. There are Google Pixels available in several colors: (Quite) black or (Very) silver. There is also a (Really) blue version available, though this may just be for the U.S. Both the Pixel and Pixel XL will be available in the U.S., Australia, Canada, Germany and the UK. You will be able to buy the Google Pixel from the Google Play Store. The Pixel and Pixel XL is available in the US, Canada, UK, Germany, Australia and India and was officially launched on October 20, though pre-ordering has been available since October 4. Alongside the Pixel, you’ll also receive a charger, a type-C USB cable, a type-C micro USB adapter and a type-C to type-B USB adaptor. Missing from this lot are headphones, which is quite surprising when you take the high price into consideration. Since going on pre-order, the Pixel and Pixel XL have flown off the virtual shelves, resulting in a several week shipping delay for anyone now considering ordering one. The first models had previously been showing shipment dates of October 20, but you've missed your chance to get one from Google directly in time for day one. The new arrival dates vary, but show at least 2 - 3 week delays in all colors and sizes. The Google Pixel, with its 5-inch display, is in some ways the successor to the Nexus 5X from last year. With this in mind, you can really see a nice style evolution from last year’s Google smartphone. In fact, it is probably one of the nicest smartphones Google has produced since the Nexus 4 in 2012, however, it certainly isn’t the best-looking model available on the Android market. And for the price, I would have expected more from Google. The Galaxy S7 and the iPhone 7, its main market competitors and the ones we compare it with the most, are much more elegant when it comes to design. That being said, it doesn’t mean that the build is better. The Pixel offers a classic design. With its complete metal design, aside from a portion of the rear that is covered in glass, it’s definitely got style. Though the smartphone isn’t very thin, I wouldn’t judge this negatively seeing as it keeps the camera lens from protruding outside of the phone chassis, creating a long elegant line. Not only that, there is also room for a mini headphone jack, a feature that other manufacturers are slowly eliminating. What I found to be a bit off-putting was the curiously light weight of the phone. Google, it seems, has managed to reduce the weight in all components of the phone, which makes the phone a lot lighter than we expect it to be. Google and HTC constructed the corners in way that makes the phone not only comfortable to hold, but also easy to pick up off a flat surface. The sides are slightly angled, making it easy to grip the phone. At the top of the front of the phone, you will find the speakers for phone calls. To the left of this just above the display is the front-facing camera lens of 8 MP and the motion sensor. And although there is no Home button at the bottom of the front of the device, Google did put a large bezel under the screen, which takes up space that could have been used for more display surface. As explained above, the back of the phone is partially covered by Gorilla Glass 4 glass, which covers the digital fingerprint scanner (not to be confused with a Home button), the NFC chip, the rear-facing camera of 12 MP and double LED flash (surrounded by a very thin aluminum frame). The second part of the rear is made of aluminum with the engraved G for Google. The antenna, which is a strip at the bottom of the phone, can also be seen. The advantage of this mix of materials is that fingerprints aren’t scattered over the entire device. The power button, which is slightly textured, can be found on the right hand side of the device above the volume control buttons. On the left, there’s a nano SIM slot. Don’t look for a microSD card slot though because it doesn’t exist. Also, Google decided not to make the Pixel completely resistant to water with a certification of only IP53, which is quite feeble next to the IP68 certification of the Galaxy S7, Galaxy S7 Edge and the Galaxy Note 7. The phones that I have mentioned can be dunked into a meter of water for up to 30 minutes, a feat that you should not attempt with the Pixel. In the Pixel’s case, you could use it in pouring rain, but only under the condition that it is held vertically. All in all, the Pixel has been a tactile pleasure: your fingers land right on the buttons and the dimensions will please all those looking for a compact and unobtrusive smartphone. I also preferred the black model, though I would be happy with the silver one as well. However, when comparing the phone to its main rivals, the Pixel doesn’t really stand out from the pack, as it doesn’t have that long-awaited wow factor we had all hoped to see. Is it elegant? Yes. But exceptional? No. The Google Pixel offers a 5-inch AMOLED screen with full HD resolution of 1080 x 1920, which is sufficient for a good viewing experience. Some may complain about the lack of a QHD display, which Google put on the Pixel XL, especially with the release of their Daydream platform and virtual reality goggles. For normal usage, full HD is more than adequate. Google optimized the user interface for Pixel, the icons are smaller and give the impression that the screen is in fact QHD. It comes as no surprise that the viewing angle for the Google Pixel is very good. I did find that the brightness was a little weak at times, though the colors were vivid and the text was very clear. Contrast and saturation were also excellent. When using the phone outside in broad daylight, I had no problem seeing what was on the screen. On the whole, my findings definitely led me to the conclusion that the display is top notch. Finally, the display’s only fault that I was able to determine was its frailty. I noticed a scratch after having put the smartphone alongside another one in my jeans pocket. This really surprised me seeing as the phone is protected by Gorilla Glass 4. The Pixel offers its users support, which goes under the name of Care by Google. This service is available from 9 AM to 9 PM from Monday to Friday and from 10 AM to 6 PM on the weekends. It is available directly from the Pixel settings, found in the left tab (called Support) next to the tab with all other Settings features (All). Google offers its services via two different methods: firstly, you can chat with a Google support technician or secondly, you can call them directly on the phone. Also, you can share your screen with a Google expert if need be, providing you give them the rights to do so beforehand. However, this is optional if you wish to preserve your privacy. I was able to test out this service on the weekend and it worked perfectly. I think that this solution will help countless users fix their problems, especially those who aren’t so technically inclined. This is where Google’s latest update, Android 7.1 Nougat, is able to shine; both Pixel smartphones come with this operating system. This is the first time that this version has seen the light of day on a smartphone in 2016. It contains exclusive functions such as the integration of Google Assistant. Google has also assured that the phone would receive 2 years’ worth of system updates and three years’ worth of security updates. I would have hoped for more, especially since this is Google’s new baby. Apple, on the other hand, puts Google to shame by offering 4 or 5 years’ worth of updates for the same price. The purest and most fluid Android experience yet. Google claims that Pixel puts forward the best Android experience that can be offered today. After one week of using the phone, I can confidently say that they weren’t lying. The software running on Pixel offers much more than what other Android smartphones are able to offer. The pure , simple and lightning fast interface was breathtaking. The apps open and close at warp speed. I didn’t notice any bugs or glitches, nor did any apps close unexpectedly. There is no bloatware to speak of, only two applications are pre-installed, Google Duo and Allo. Google released an update in Canada (and likely will soon be released to the US and rest of the world) which will allow users to wake their screen to see their notifications and alerts using the same double tap and raise-to-wake functions as their Nexus predecessors. The design is also easy on the eye with its small circular icons. Google also had the smart idea to integrate Force Touch, a feature that Apple also has. This means that when you long press on an app icon, you get access to multiple shortcuts (up to 5) to launch various actions. For example, by default Google will offer the option to display your route home. A second partition, which is also a new feature, allows silent updates to roll out much more smoothly. Android updates are in fact installed in the background and happen automatically when you restart your phone, which saves you the long wait usually occurs with Android updates. Another exciting addition to the new interface is the perfect integration of Google Assistant. Thanks to this feature, the user experience with Pixel is very different to that of other smartphones. Searches are always carried out in context and, thanks to the system’s Artificial Intelligence, are spoken out loud to you. Google Assistant can be activated by long pressing the on-screen Home button. Assistant is the pièce de resistance of the Pixel smartphones. Its interface is simple and the voice sounds very pleasant. That being said, I don’t see why I need to start a conversation with Google Assistant when I can simply search for something through the Google app. I also found that Assistant is still missing some functions and it seems that it is still under development, so future versions should be much better. For example, I couldn’t order a pizza. Though this comes down to personal taste, Google Assistant shouldn’t be your sole reason for buying a Pixel. The Snapdragon 821 (alongside the Samsung Exynos 8890) is the fastest processor that exists for Android. It has been optimized to work smoothly with the VR Daydream platform, contrary to the Snapdragon 820. It is also great for gaming. The Pixel boasts the best possible equipment to offer great usability and performance without compromise. With 4 GB of RAM, it offers high speed performance for all multitasking purposes. The Google Pixel’s excellent performance often outshone even the Galaxy S7 in some areas. This is probably the most optimized Android smartphone I have ever used. The only time the phone overheated (however this was only ever so slightly) was when I took some photos with the camera or played some graphically demanding games. Google has also upped the ante when it comes to gaming experience, providing a better experience than the Nexus can offer and even better than the Galaxy S7 in some instances. Its biggest weakness is, however, its small memory, which cannot be expanded with a microSD card. The system uses up 7 GB of the 32 GB model, leaving just 25 GB for apps, pictures etc. If you are an app addict, then you will soon run out of space. Thankfully, Google offers unlimited cloud storage for high resolution pictures, which should compensate for the lack of the microSD card slot. Here lies one of the Pixel’s biggest problems. Google clearly didn’t make sound one of its priorities. The smartphone only has one mono speaker on the bottom of the device. This sound emitted is of average quality, which is sufficient for playing games or watching movies. That being said, the maximum volume becomes a little warped and is not pleasant to listen to. What’s more, when holding the device, your fingers tend to cover up the speaker. On the other hand, using the Google Pixel for phone calls won’t leave you disappointed. I had excellent reception, even in the subway and both the caller and callee could hear each other perfectly. Google has recently confirmed that the audio issues which have hounded the Pixel are a hardware issue, so they will not be able to rectify these via a software update. While the company hasn't gone as far as offering refunds for the Pixel and Pixel XL, Google is offering a warranty replacement to any affected owners. 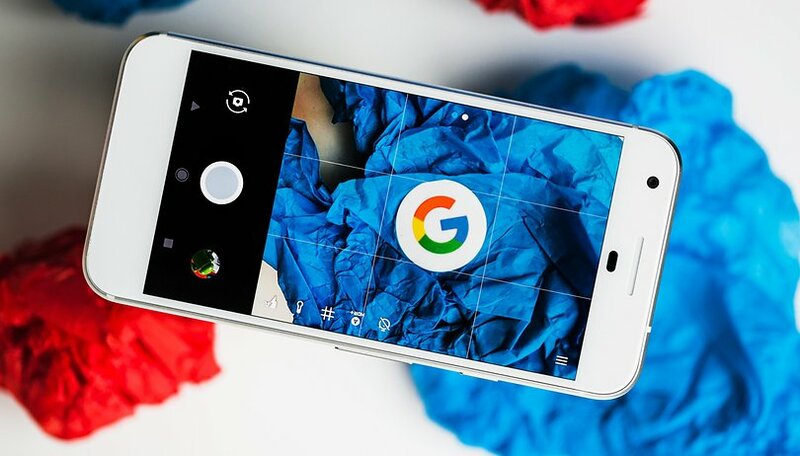 Google chose not to offer a double camera, a new trend followed by the likes of LG, Huawei and Apple. Its main camera shoots with 12.3 MP. According to the DXOMark, the Pixel is one of the best smartphones for taking pictures, beating rivals like the Galaxy S7. While testing the device, I also came to the conclusion that it has a good camera. But the best? Not really. When comparing it with the S7, I found that the Pixel was less apt at taking pictures of moving objects. The Pixel also doesn’t have an optical image stabilizer however, this didn’t cause a problem when shooting videos. This feature did make a difference with pictures though. The camera interface is no different than the one found on Nexus devices, coming with the same features, 4K video and fast motion. I had fun using slow motion after shooting videos. The front shooter offers 8 MP (1.55 µm) and an aperture of f/2.0. There’s also a point laser and a dual tone flash. The Pixel will satisfy any selfie fan. The Pixel comes with a 2770 mAh battery. Considering the phone’s thickness, I would have expected more. For example, phones of the same quality offer batteries around the 3000 mAh mark, like the Galaxy S7, the Huawei P9 and the Xiaomi Mi 5. Thankfully, Google was able to perfectly optimize hardware and software to reduce unnecessary battery drainage, which became apparent while I was testing it. I wouldn't say that it has the best longevity out of all the phones on the market, but it will give you a good day’s worth of usage even if you use it at full throttle (taking pictures, 4K videos, benchmark tests, WhatsApp, emails, games etc.). You can count on the Pixel for about 5 hours with normal brightness before the battery starts to dwindle. If you don’t use it so intensely, your battery life will be longer. There is no wireless charging, however quick charging is available. Within an hour and a half, your phone will be ready to go again. During Google’s unveiling of the device, they had promised a full 7 hours of usage after just 15 minutes of charging. This, however, is not very realistic. My thoughts on the Pixel? For Google’s first independent smartphone, they did a good job and it fits right in alongside other high contenders on the market. Apple has its iPhone, Google has its Pixel. If you’re looking for the best Android experience, Pixel is the way to go. The system is smooth, performance is excellent and you are sure to get system updates on time and ahead of the pack. It has a remarkable camera and offers a support service that you can reach almost 24/7. Not only that, the fact that it can be easily rooted will also make modders and tweakers happy. The down side is, of course, the high price. One should consider if the Pixel is really worth it. Can the Pixel really compete with the star Android device of the moment, the Galaxy S7, which is about $200 less? The Pixel is a great smartphone but it is very expensive. Its design, though very elegant, is not very original and it is missing some functions which are sorely missed, such as a microSD slot. The Pixel smartphones by Google therefore still have a few things to fix before they can beat the bigger contenders on the mobile market - the Galaxy S7 and the iPhone 7. However, I am sure that the Google Pixel 2 will be better equipped and ready to take the Android world by storm. Your android-Apple market share is opposite to the actual fact.Android's beating Apple big time. not much of an upgrade from my current Nexus and certainly not worth the current price tag. Waiting for version 2... .
google likes to keep devices unlocked etc. and they give the pixel to big red who locks everything down. makes no sense. This is just the beginning for Google. The next version will have front facing speakers and a more refined design with thinner bezels. Hopefully, the version after that will have Google's own Soc closing the optimization gap with Apple. It seems a bit unrealistic that Google will step into the SoC-Game. Designing a SoC for mobile phones is not that Google can just pull out of nowhere. Now the only problem with Google Pixel phone is its availability! Agreed. But maybe that's a good thing. So after rereading the review I'm a bit more interested in the Pixel. It is a size and form factor I like and prefer. I'm going to wait and see some of the forum comments from real world users before deciding. yup Pixel is more appropriate in size for me too. Interesting article. I want to have link for test pictures u took... I had visited DXoMark website and saw pictures taken from Pixel and they were quite impressive and pictures taken from iPhone 7 pictures were not much impressive.. Since the nexus 5X Google is so good with the cameras! And...🎥action! Is Google forgetting who they are? Not totally. A bit of a compromise perhaps (I have a Nexus 5x), but obviously they want to sell more phones. This will probably work. I hear they're going to continue their mid-range offering with a new phone next year. Sort of a original Nexus replacement. They're tilting toward what works. So is Apple. Both will be forced to leave their roots a bit. and they are saying "people will soon forget about the name Nexus" I don't think so!